It is said that the path to success is not straight, and as TiE warns, “the key to entrepreneurship is often recognizing that the path to success can be a meandering journey or an all-out race.” Entrepreneurs of all ages and stages, from high schoolers to retirees (if entrepreneurs ever retire), were welcomed at TiE Atlanta’s marquee event, TiECON Southeast 2013, which also celebrated TiE Atlanta’s 15th anniversary. With keynote speeches to wow, pitch sessions to inspire, and mentor roundtables to provide practical “how-to’s,” attendees could see a range of possibilities, network—even with angel and venture capital investors—and jump into the thick of it. The visionary Don Panoz spoke about his ups and downs on the path to his invention of the nicotine patch, his out-of-the-box idea of starting the Chateau Elan Winery in Georgia, and his entirely different venture into Panoz Motorsports. His remarkable DeltaWing race car (no battery; half the weight and fuel consumption compared to normal) was on display outside. Hence, his book will be titled “Drinking, Driving, and Drugs,” he joked. He considers himself a dreamer, but a dedicated one. “Leave everywhere you’ve done business, better off than when you found it.” Don was presented TiE Atlanta’s 2013 Life-time Achievement Award. Dr. Kiran Patel is a leading entrepreneur who has successfully turned around troubled managed care plans and created billion dollar companies as well as having a medical practice. His motivational video declared that “Heroes chart new paths and may run into trouble but are not defeated”—with the odd example of Cadbury India, and odd clapping to Latin chant. His zeal for his work is tremendous, and when hiring, he said, he looks for people who will also give huge efforts: he does not look for the best or most experienced, but for the #2 who will be willing to push and who can be molded to his mindset. A fundamental issue every human has, he believes, is greed, which can bring you down. After his great success with WellCare and after a non-compete agreement kept him out of managed care for five years, he turned to the creation of the Foundation for Global Understanding, which led to the Patel College of Global Sustainability at the University of South Florida; his donations to USF have surpassed $25 million. Dr. Sid Gautam, Founder and Director of STEP (Society to Educate People), and Founder of the Center for Entrepreneurship at Methodist University, also spoke. Aside from a PhD in financial economics, he is a Vedic scholar and motivational speaker on spirituality, meditation, and yoga. He confronted the idea of greed, which overtakes the American dream, by focusing on happiness—not as a result of success, but as a precondition for it (Chinmayananda). High school students competed in teams, pitching their projects in fields as diverse as organic hydroponic food, computer processing power, and music auditions. This TiE Young Entrepreneurs (TYE) program gave them a depth of experience both in developing their projects and presenting them before the judges and audience. Teams Spark (project: event management) and Angel Wings (food heating) tied for first place; one will be chosen to continue to global competition in D.C. in June. Later pitch sessions allowed more seasoned entrepreneurs to be heard by local, national, and international investors and venture capitalists. Social and environmental issues addressed included mobile healthcare, diabetes management, imaging during surgery, mini-cameras in surgery, insurance policies for financing, employee continuing education, and student management software. Emceeing was the excellent and refreshingly “100% clean” comedian Dan Nainan, an American of Indian and Japanese origin who joked about his start in the IT world. He wants to open the first all clean comedy club in North America. 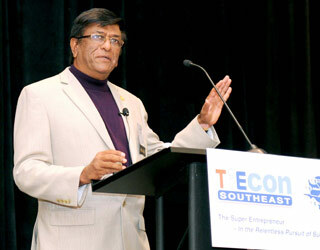 President of TiE Atlanta, Palaniswamy “Raj” Rajan, noted that on its 15th anniversary, with Sanjoy Malik (the founding president), Chand Akkineni, Vir Nanda, Deepak Raghavan, Murali Anantharaman, and Jason D’Cruz, 7 of the 15 original cofounders are still active, giving back, and mentoring new entrepreneurs. Organizers of this event—he; Kunal Jain, President of TiE Tampa; and Abhi Muthiyan, President of TiE Carolinas—agreed that, as with previous TiECONs, attendees have raved about the helpful content, connections, and positive outcomes for their ventures. And now members do not need to be in technology companies or be Indian. Teams Spark and Angel Wings tied.